It’s Jana here. I bet you are all excited about the amazing new collections! Today I have decided that we will do a little flashback ... I will show you my finally finished December Daily album. Hooray! 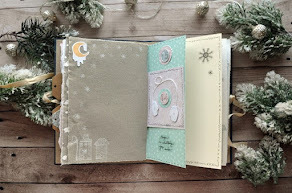 For the entire album I used the wonderful ‘Just Chilling’ collection and December Kit. What great materials! I didn’t have to think much about it and I could just enjoy the scrapping. I do recommend using one collection, it makes your life so much easier. There are few pictures of the album in this article and at the end you will find a flip through video. 3D effect looks so good in these small albums! If I have too many pictures to fit on one page, I always try to do some interactive feature. Here it is a cute little booklet . Using die cuts to create the snowflake border. Here I tried the same trick with Big Shot but I went a touch too far and the letters ended up getting cut through. So I simply used them in a different way. And the last detail picture is of my handstitched deer ... soooo Christmasy. Enjoy the little flipthrough video, I hope you will like it. 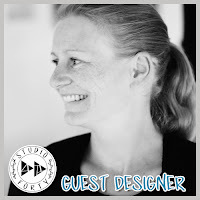 At the end I would like to say thank you to Monika who gave me this wonderful opportunity to write for Studio Forty blog and use the most beautiful materials. Also thank you, dear readers, for your support. May you always have enough time to enjoy this wonderful paper hobby of ours. Jana, thanks for your wonderful designs - I love them all! This album is just perfect and very insporing for me! Wish you all the best! Thank you sooo much, Magda. You are so kind!! What a beautiful album! I love all your projects for Studio Forty, they are very inspiring for me! Thanks for the joint time here! Good luck! Oh, that is so nice of you!! Thank you so much! A I said, i will still folloe you all, you are great team!